Atlanta, GA (April 11, 2017): David Weekley Homes recently gave back to the local community by preparing meals for both local heroes and families staying at the Ronald McDonald House. These projects are part of the volunteer and philanthropic efforts of the home builder’s CARE program. Team Members and homeowners from the communities of Village of Belmont and Vinings Brooke worked together to host HERO Appreciation Breakfasts for local first responders. The event was very successful, providing firefighters, police officers, EMT’s and other city members a hearty breakfast as well as a chance to also educate the community about their roles. 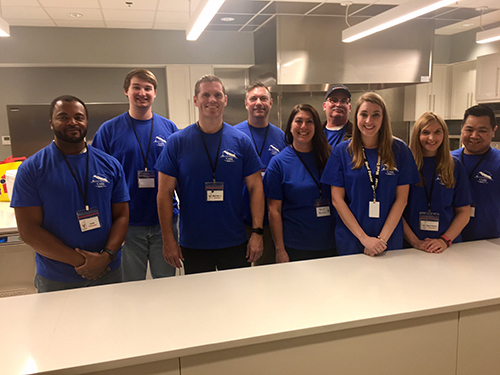 Several team members from the Atlanta area prepared a home-cooked meal for families staying at the Atlanta Ronald McDonald House. In addition to cooking the meal, they also donated all the food for the meal. For more information about David Weekley Homes in Atlanta, call 800-407-9150 or visit www.davidweekleyhomes.com. David Weekley team members prepare a meal at the Ronald McDonald House.